Accelerated Bachelor's/Master's Program in Computer Science and Software Engineering (ABM-CSSE). Coming soon in the Fall 2019 semester. All graduate degrees involve creative research working closely under a faculty member and advanced courses in students' areas of interests to build on undergraduate knowledge and skills. The Master of Science thesis option requires a research project, the completion and defense of a thesis and a final examination. The non-thesis option allows students to earn this degree through course work, including an optional capstone engineering project. The Master of Science in Cybersecurity Engineering program is to equip students with the advanced education required to analyze, develop, investigate, protect, and defend computer information systems. The Master of Science in Data Science and Engineering program prepares students to pursue careers in data science and engineering, where valuable insights are derived from massive amount of raw data. The graduate certificate program in Cybersecurity Engineering focuses on analysis, development, investigation, protection, and defending of computer information systems. The doctorate program entails a qualifying examination that covers graduate materials and a general examination over the major and minor fields, a dissertation that demonstrates quality scholarship and investigation and a final examination on the dissertation and related subjects. 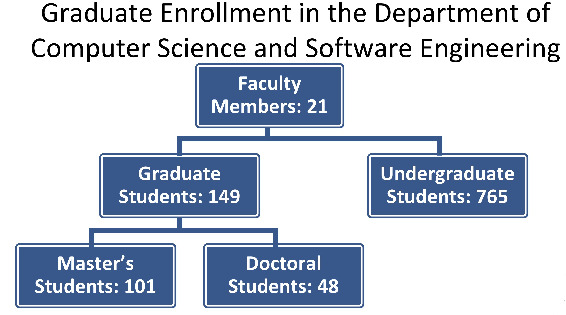 Graduate study in computer science and software engineering provides students with opportunities to further their education through advanced courses in their areas of interest, and to exercise and sharpen skills developed during their undergraduate education. The graduate curriculum is directed toward creative research with the CSSE faculty members.